Most of the past week was spent stitching my block and preparing my post for the New Block Hop I participated in this week. If you haven't checked out those posts, we have some amazingly talented participants with some really awesome blocks. (Links to day one posts and to the hosts can be found in my last post.) Beyond that, everything has been about preparing to quilt a number of quilts. That number happens to be five. I helped my daughter baste her doll quilt. She's getting very excited to give her gift. Here's the front view and a peek at the backing/label. 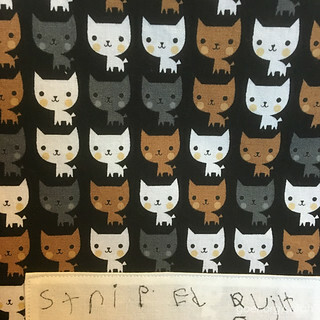 I love that she's named it Striped Quilt. I have a secret project that is basted and ready for some straight line quilting. No pics. 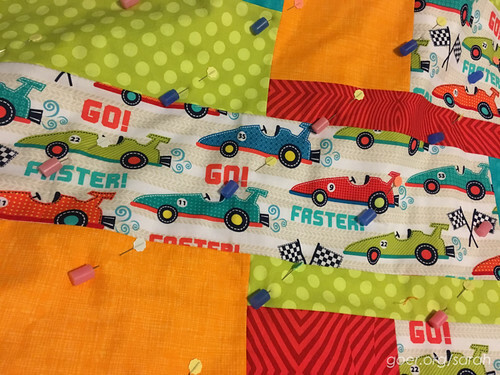 The race car quilt is basted and ready to quilt. I'm going for some Jess inspired free motion on that one. 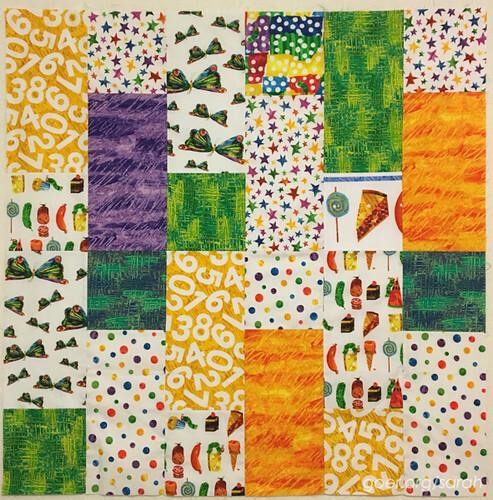 I hope to crank out a fast finish on a Very Hungry Caterpillar baby quilt to deliver this weekend. It's all ready to baste. I love that it's small enough to not need a pieced backing. The label is above. Now I'm hoping for some great sewjo and a few really productive days of quilting. Fingers crossed. I start by working on my hardwood floor to baste, using blue tape to tape down only my backing fabric. I pin baste. I like to use Clover Flower Head Pins and Pinmoors. I am very generous with the number of pins I use, pinning every 3-4" to avoid shifting. Generally, I put all the pins in, remove the tape and then sit in a comfortable seat while I put on the Pinmoors. (I love how fast and easy they are to remove during quilting.) 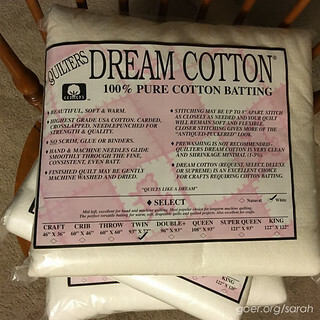 I use Quilter's Dream cotton batting exclusively. My quilts usually stay in California, and it doesn't get that cold here. My preferred batting weight is Select. I use both walking foot and free motion quilting, all done on my domestic machine, which has a 7" throat (the space to the right of the needle). The largest quilt I think I've quilted on it to date is Bold Blooms, which is 65" x 83". Our king-sized bed quilt is the one quilt I've sent out to a long arm quilter. (I just wanted it done!) I use a closed toe darning foot for free motion quilting, but wish I had an open toe darning foot. I think that's about it. Let me know if I missed anything you'd like to know about! Posted in Quilting. 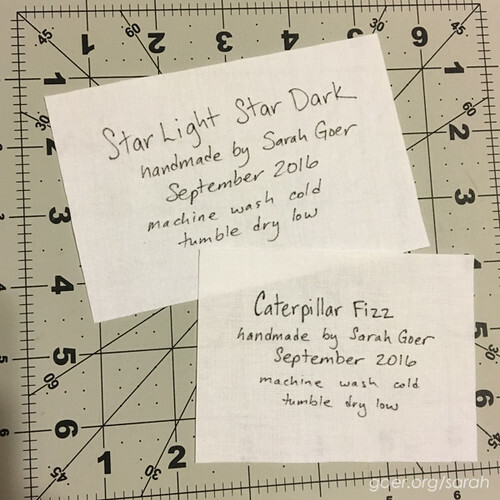 Tags: Caterpillar Fizz, quilting with kids, Star Light Star Dark, Striped Quilt, Very Hungry Caterpillar, Zoom Zoom on September 14, 2016 by sarah. I love my open foot. Never used pinmoors but will have to try those out! I love spray baste and pinning the edges, but I'm always up to try something new... YAY! 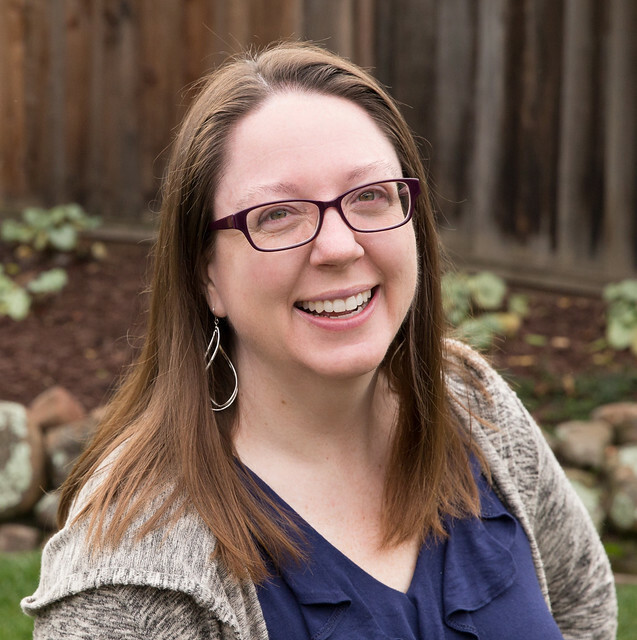 SLSD has a home! I can't wait to see all the quilting you're going to do. I go through phases like that too, where I do a LOT of quilting at once. Good luck! Spray basting is intriguing to me, but I don't really like arousal sprays in general and since I'm happy with my situation, I think I'm in an "if it ain't broke, don't fix it" place. ;-) I was going to give my sister a different quilt, but decided on this one since I'm more excited to finish it. I think I have three other finished quilt tops. I may be in the quilting a lot phase for a while. But yay to finishes and a shorter WIP list! :-) Thanks for visiting, Jess! Wow! You are going to have so much fun quilting five quilts! Congrats on having them basted and ready. I hope you get lots of sewing time! Thank you, Beth. Time and motivation is my wish. :-) I hope my excitement about getting them done fuels me. Good luck with quilting. All the quilts are wonderful. I think I need to jump on the Star Light Star Dark bandwagon, albeit a little late. It's not too late! You could even crank out a finish to link up with Jess by October 3rd. It goes together so quickly! Thanks for visiting, Anja! 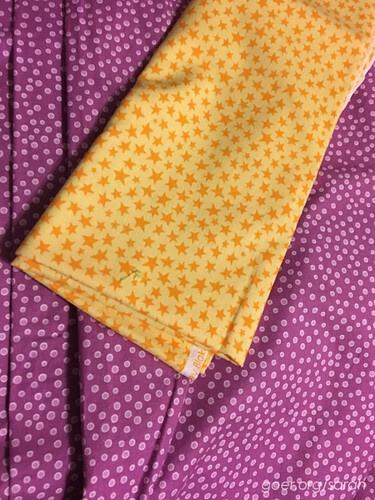 I love the fabrics you have chosen to finish your Star Light Star Dark quilt. I think we'll be seeing some fun finishes soon (you can do it!). And how awesome that you are getting your daughter labeling her quilts; I finally broke down and ordered some tags to sew into my binding. Hopefully that will at least get me doing a better job than I have been doing lately. It took many tries and tempted my patience, but I love her hand written label. I love the tags that I've seen people use, but I want to put the name of the quilt and the date finished, so I don't think that's a solution for me. I've also started writing washing instructions for quilts that aren't staying with me. Thanks for visiting, Yvonne. 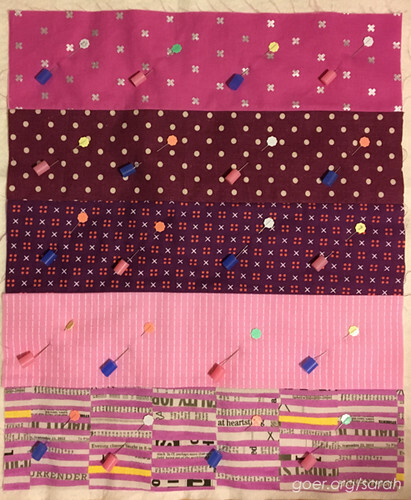 Your daughter really picked out some pretty colors that go so well together for her doll quilt. I am impressed!! 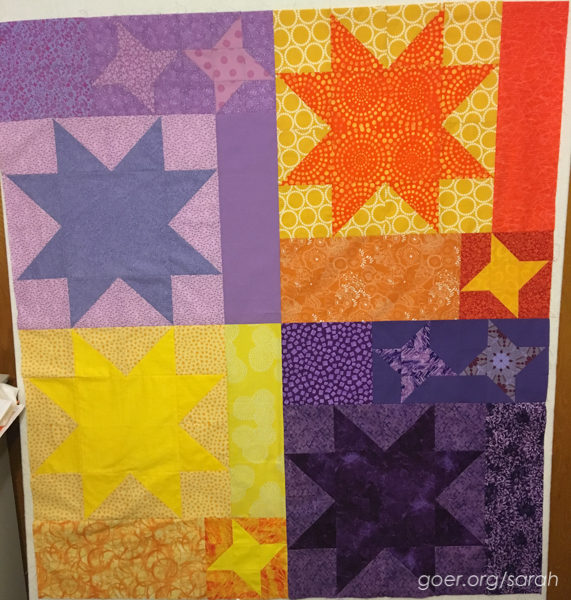 Star Light, Star Dark quilt looks great!! So glad you are making headway with your passion projects!! Thank you, Bo. These are all fabrics she chose when we shopped the quilt shops in Portland this summer. I agree that she picked some great fabrics! It looks so productive seeing all those quilts lined up and ready to go. I guess we'll be seeing some finishes soon.